The first draft of my thesis for the accreditation to direct research (Habilitation à Diriger des Recherches) is available online. 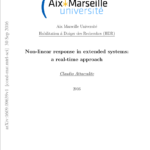 The thesis covers my studies of the non-linear response in solids and nanostructures by means of real-time simulations. In the thesis I discuss how to couple electrons and external fields by means of Modern Theory of Polarization and how to include correlation effects by means of Green’s theory and Time-Dependent Density Functional Theory. Update: I got my HDR the 10/2/2017, here the news on the CiNaM website.